Agia Pelagia, Crete. An ideal place for holiday in Crete. Right in the middle of palm trees, flowers and beautiful greenery, located where antiquity meets medieval tradition, about 20 klm from Heraklion city, you will find Agia Pelagia: a cluster of villages fused into one, deriving its name from the nearby monastery and being on land that has been inhabited since ancient times. 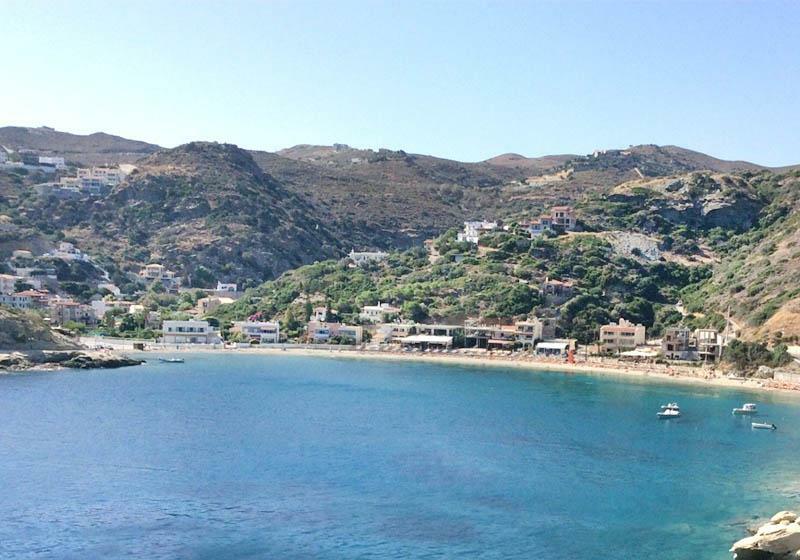 Agia Pelagia has it all- peace and quiet as it is located away from the main road, beautiful beaches to choose from, and a lot of color, folklore and loving, hospitable locals. One of the beaches, the eastern one which is also considered the main one, is lined with tavernas and bars. If you want to opt out of restaurant lunches though, you can also visit the supermarket there and get yourself what you need for a picnic. The other three beaches aside the main one, Kladissos, Mononaftis and Psaromoura, each have their own little treasures for you to discover, from interesting rock formations in the bay to green waters and underwater rocks for you to sift through- so if you are a fan of snorkeling or underwater photography, you have the perfect place to go! And if you just like to watch and enjoy sea life, you can even visit the Aquarium in the area. Before driving an hour to get there though, and if you like to discover all the gifts the area has to offer on your own, you should walk from the main beach of Agia Pelagia to Ligaria beach, which is quiet and protected, to give you privacy and the perfect place for down time. If you are in the area of Agia Pelagia, you shouldn’t miss out on visiting some interesting and unique cultural sites, such as El Greco’s village, Fodele and of course the famous palace of Knossos. Lastly, if you fancy discovering more places by boat, the beach of Bali is awaiting, and so is the island of Dia with the submerged village, just waiting under the sea, a unique opportunity for snorkelers!